Vancouver Island is home to mountains, glaciers, lakes, forests of centuries-old trees, and hundreds of kilometers of coastline. The hiking opportunities here range from multi-day coastal treks to full-day summit hikes and peaceful walks through meadows and valleys. Along the rugged west coast of the island, you’ll find life-changing hikes, like the West Coast Trail and the Juan de Fuca Trail. In the interior are ancient forests and alpine areas to explore on foot. Even if your travels take you no farther than the provincial capital of Victoria, you won’t be disappointed with the hiking opportunities. For a look at trails that range from wheelchair accessible to demanding week-long journeys, see our article on the best hikes on Vancouver Island. 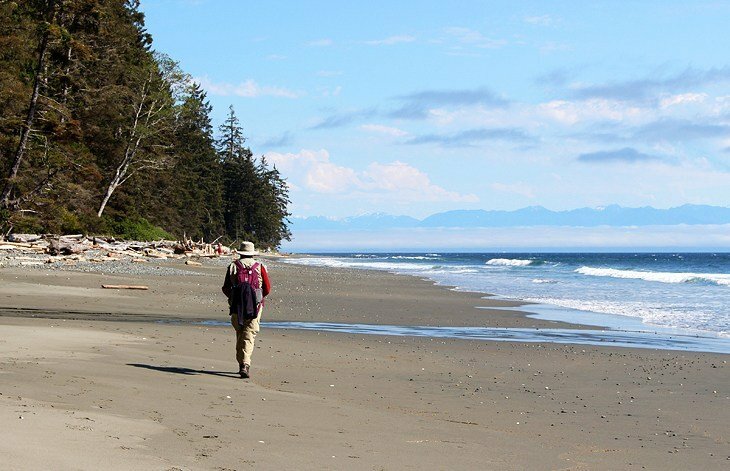 The Juan de Fuca Marine Trail, usually just called the Juan de Fuca Trail, is a multi-day trek that runs along the wild west coast of Vancouver Island, from China Beach to Port Renfrew. This hike takes you along beautiful open stretches of beach, over rugged shorelines and headlands, and meanders through a forest of huge Sitka spruce; western hemlock; and western redcedar, B.C.’s provincial tree. The enormous size of these trees is breathtaking. But you don’t have to complete the entire trail to enjoy a day-hike along the Juan de Fuca Trail. You can access the trail from China Beach, Sombrio Beach, and Port Renfrew, near Botanical Beach. Each of these sections offers something a little different. If you are staying in Port Renfrew, don’t miss an opportunity to take a stroll along this trail, down to the ocean and through some dense forest and towering trees. It’s also worth wandering down to the trail at Sombrio Beach, where you’ll find oceanfront campsites looking out over a wide swath of beach. China Beach is one of the most beautiful and easily accessible sections, but the actual trail only leads through the woods from the parking lot, so you will have to detour a bit to see China Beach.